Despite the protests planned for the 25 January revolution's third anniversary, and consequent security concerns, the Cairo International Book Fair opens its doors for the 45th round on 22 January. Angry demonstrations in Egypt's tumultuous years following the January revolution were detrimental to the annual Cairo International Book Fair. Yet, the largest cultural event in Egypt is determined to plough ahead. Located in Cairo's volatile Nasr City neighbourhood -- where violent clashes between security forces and the Muslim Brotherhood have regularly erupted -- this third book fair since the 2011 revolution is likely to face even more uncertainty. Observers and experienced book fair admirers know quite well that the Cairo International Book Fair isn't just an opportunity to sell books, exchange sales and copyrights, or even a chance to network. The book fair has traditionally played a significant role in political life – as evidenced by the extent of media and government focus directed towards it. 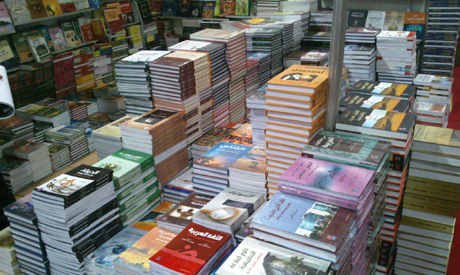 The Cairo International Book Fair stands out because it has been the scene of demonstrations by opposition and intellectuals, the Muslim Brotherhood after Friday prayers, the Cultural Café forum that hosts intellectuals and political figures, plus significant religious presence in numerous forms. According to former minister of culture Emad Abou-Ghazi, politics seeped into the book fair for the first time when Israel was invited to participate in the early 1980s following the peace treaty signed in 1979. It was the beginning of then president Mubarak's era, and the invitation was met with huge resentment from Egyptian intellectuals. They called for demonstrations at the fairgrounds, which were followed by mass arrests. Mubarak was finally forced to give in to the intellectuals and exclude Israel from participating in 1987. “The fair was a place to protest when protesting was not legitimate and had no room or associations to protect it,” explained Helmy El-Namnam, former deputy of the General Egyptian Book Organisation (GEBO), the official body responsible for the fair. After excluding Israel, demonstrations continued, but over causes such as solidarity with Palestine and against the war on Iraq. After 2004, however, other political forces like Kefaya, the April 6 Youth Movement and Independent Judges played a larger role in political opposition. Also, the protests shifted focus to criticise the extension of Mubarak’s term in power, his son Gamal's "inheritance" of the presidency, and relations with America and Israel, according to El-Namnam. Below are some of the most significant incidents to have taken place at the book fair over the years. Cairo University Sociology Professor Ahmed Zayed stressed that the fair played a vital role in entrenching regime figures among the intellectual elite. Ultimately, he said, the fair served not only as a space for Mubarak’s opposition, but also created a class of intellectuals among his allies. “It was a good chance for the regime to present certain names through seminars, ranging from politicians and media stars to intellectuals. That is why the fair did not present new blood to the Egyptian cultural body,” Zayed pointed out, adding that the fair was a machine to reproduce the regime with slanted, pro-regime publications. Political analyst Hassan Nafaa agreed: “If you track the list of lecturers invited to the fair, you’ll easily recognise what exactly they were trying to do. At the onset of his rule, Mubarak was open to all currents, attempting to bring some of the big names to his side: Mohamed Hassanein Heikal, Pope Shenouda, Farag Fouda, and many others from the opposition. However, when the regime discovered that this could negatively reflect on its goals, it excluded anyone who differed,” he explained. Later, he continued, stronger pro-Mubarak figures began to be presented and the fair took on an even deeper political role. Renowned religious preacher Amr Khaled first made an appearance at the 2000 Cairo Book Fair, preceded by heavy advertising reportedly prepared by the Muslim Brotherhood. Since then, Khaled's reputation spread throughout Egypt via cassette tapes, CDs, videos and even pamphlets. Although presented as a religious phenomenon, many Egyptian analysts speak of Khaled in political terms. They believe Khaled is a regime agent attempting to divert people's attention away from corruption and economic conditions to religion, without openly promoting the Brotherhood's political agenda. Amr Khaled was among the few who eventually refrained from politics after Egypt’s January 25 revolution. It was also in January that protests in Egypt erupted against US policies in Iraq -- and it was at the book fair of 2003. Protesters gathered in the main avenue of the fair grounds, but security guards were deployed to surround the entrances and prevent entry or exit. Originally, Egyptians started to protest the fact that then Israeli PM Ariel Sharon had been invited to Egypt. This quickly turned to protests against American policies towards Iraq, and the fair became the spot for expressing that anger, still under police control. Mubarak’s tradition of meeting the intellectuals every year during his inauguration of the fair aimed to promote the impression that the state cared about their opinion. In reality, it was an effort to absorb them into the regime and to make them indirect advocates, according to political analyst Hassan Nafaa. “Some intellectuals tried to make use of these meetings to propose new ideas to Mubarak, but many of them used these meetings to flatter the regime and openly praise its figures in anticipation of some reward, or out of fear of their heavy hand. I’ve seen it myself during some of these meetings,” says Nafaa. This tradition continued until 2005, when late political thinker Mohamed El-Sayed Said came up too close against the president. Said, who requested to comment after Mubarak's speech, boldly asked the president to introduce amendments to the constitution relinquishing some of the president's powers, to which Mubarak responded "You're an extremist." Said’s challenge didn't pass lightly: that same year, aside from all of Said's lectures and meetings at the fair being cancelled, there was a fierce crackdown on demonstrators opposing Mubarak’s attempts to pass his throne on to his son Gamal, as well as heavy-handed banning of books, including works of the revered, late Palestinian poet Mahmoud Darwish, while books such as Dan Brown's Da Vinci Code were allowed. This meeting, Mubarak's last for the next five years, heralded additional limitations and oppression faced by the fair. For the second time in a decade, the most notable event of the book fair was receiving an Islamic preacher as part of the cultural programme. Although Al-Karani's session witnessed the highest attendance of the entire programme, it caused a stir by raising the question why religious events were being hosted at the book fair. The response was that Al-Karani was invited to celebrate his best-selling book of the year, Do Not Be Sad, which, according to the distributors, sold nearly two million copies. The General Egyptian Book Organisation further defended the session, claiming this reception was not part of their programme, but the Saudi publishers' -- over whom the Egyptian book organisation has little control. The Saudi cultural/political agenda, now most evident with the rise of Islamist Salafists in Egypt, was certainly promoted at its Cairo International Book Fair forum. Fair visitors and participants discovered, to their surprise, that the favourite spot for meetings, discussions and afternoon chats was absent. The little café, with its relatively cheap prices and simple décor, traditionally stood right next to the cultural activities tent, Al-Maqha Al-Thaqafi. The tent was there, but the café wasn’t. Despite dozens of food and beverage outlets at the fair, the Cultural Café was the usual meeting point for intellectuals and activists. In a metaphorical sense, the Cultural Café was the Tahrir Square of the time, where demonstrations were masterminded. In addition, the fair entrance was found closed to visitors on Fridays (a traditional demonstration day) until 2pm, again curbing what space there was for demonstrations. Although by then Kefaya and various other movements had begun demonstrating in other locations, the fair had nevertheless represented the biggest of such gatherings. The state security approach proved to have exceeded all expectations. Late Nubian author Idriss Ali lived just long enough to witness the banning of his book from the last pre-Arab Spring round of the book fair. The author poked fun at Libya’s now late leader colonel Gaddafi in his famous book, The Leader Has a Haircut. The last fair in 2010 also witnessed the peak of tensions between Egypt and Algeria. The football match between the two teams for the 2009 World Cup turned violent, adding another sore point the countries’ football feud. Various projects and businesses were affected by the incident, including the book fair, which Algeria boycotted. The tradition of meeting with intellectuals was conducted one last time before Mubarak's presidency ended, albeit this time tightly planned: invitations were sent to a select few and the message of the meeting was straightforward: "The president's health is in very good shape." The meeting was simply meant to dispel rumours that Mubarak's health had severely deteriorated and that his son was preparing to take over power. Cancelling Mubarak’s tradition of meeting Egypt's intellectuals on the first day of the event, ousted president Mohamed Morsi choose to meet the publishers instead and spare himself probable criticism while inaugurating the fair. The fair was battered by ongoing political tensions and street clashes between security forces and protesters. Egyptian Minister of Culture Saber Arab -- who held the same post under Morsi -- resigned five days before the end of the fair on 4 February, in protest against the assault on protester Hamada Saber, who was displayed on television beaten and stripped of his clothes by police during anti-government protests near the Presidential Palace.